Mountain Dew Kickstart is a new breakfast juice drink. Seriously, its 5% juice concentration means it’s a juice drink and not soda. There’s some caffeine in there as well. I haven’t seen mention as to whether it’s carbonated or not, but it might be. There will be two Kickstart flavors – Energizing Fruit Punch and Energizing Orange Citrus. This sounds like a bad, bad idea to me. Seriously – do we really need breakfast soda? I’m a big fan of fruit juice and juice drinks, but a caffeinated 5% juice drink doesn’t seem all that appealing to me. I do like carbonated juice drinks, though, and am finishing up a can of IZZE Sparking Blackberry as I write this. The IZZE is a 8.4 oz can with 70% juice and no caffeine. 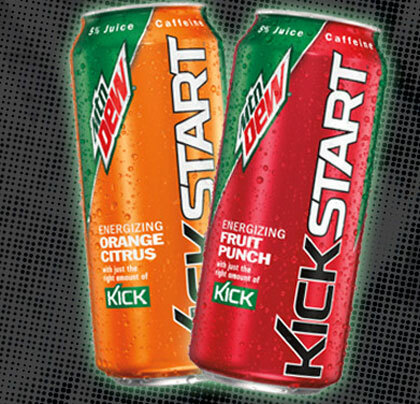 An interesting note – Kickstart is said to have more caffeine than regular Mountain Dew, and uses artificial sweeteners to lower the calorie count. The “free” cans are already gone. Bummer, I would have given it a shot for free! Wow that was quick! I signed up a few minutes ago and *should* be receiving a can in 3-5 days. I’ll try it once, but with artificial sweeteners and a 16oz can size it’s not something I will ever seriously consider having with my breakfast.